It's getting close to a year since Microsoft and Salesforce.com announced their strategic partnership, and the fruits of their union are beginning to appear. After discussing a number of planned joint products last fall, the two companies on Wednesday launched one of them -- the Salesforce App for Outlook -- into beta. 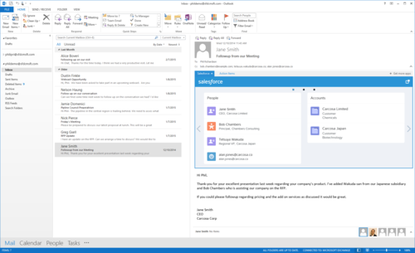 Salesforce App for Outlook is designed to allow users to view Salesforce contacts, leads, accounts, opportunities, cases and users from within Microsoft's Outlook and Office 365. So, when a salesperson receives an email from a customer, for instance, he or she can access all that Salesforce information without having to leave Outlook first. Available for free to those with a subscription to Salesforce Enterprise Edition or higher, the tool is entirely cloud-based and requires no installation of software. It works with Outlook 2013, Office 365, Outlook for Mac and the Outlook Web App (OWA). "Horses for courses, I always say," said Denis Pombriant, managing principal at Beagle Research Group. "Some reps just like to stay within Outlook, where they do their email, so bringing Salesforce data to them makes a lot of sense." Though Microsoft and Salesforce also go head-to-head in the CRM arena -- Dynamics is Microsoft's competing offering in that space -- their partnership is focused on creating key integrations demanded by users, the companies have said. Other products in the works toward that end include a Salesforce1 mobile app for Windows devices and tie-ins between Salesforce's software and Microsoft's Excel and Power BI tools.